MMT Motorcycle Training was formed in 2004 and is the largest training school in the South Durham and Cleveland area. With 10 instructors in total, 5 of them Cardington approved to deliver Direct Access, means we are able to fulfil all your training requirements. We are only 10 minutes from the MPTC Test Centre for both Module 1 and 2 testing so all of your riding time is spent learning the test routes not travelling to and from the area. We have 5 CBT training facilities, two of which can be used for Module 1 practice. We also have access to the actual DSA test centre so using MMT means there are no 'surprises' come test day. MMT Service and Repairs offers full Workshop facility's, Tyres and MOT prep. Graeme Ward is a factory trained technician with years of experience. 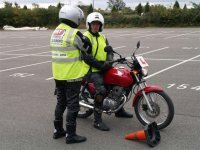 If you would like more information about Motorcycle Training in Darlington or our Service and Repairs please contact us now on 01325 267 569. You can also send us a message via the enquiry form on the contact page.